One of my favorite pastimes is to find a spot on the Truckee River or at Pyramid Lake and fish for trout. It can be said that there is no better relief from the trials and tribulations of the day to day workweek as this pleasant hobby. Anyone can do it given patience and good health. That being said, I wanted to spend some time going over both destinations as they are very different. First though, I would say the best possible way to fish these extraordinary waters is with hand tied barbless flies. After looking over the spot I will be fishing, the ground cover, the hatch and the weather, I’ve gotten to the point I just take a handful of dry or wet flies I tied the night or week before and begin fishing. But that’s not the only way to fish these spots. I also like to lure fish and except for the weight of the spoon or spinner, both Pyramid and the Truckee can be fished with very similar items. We all have our favorites, but some of the more trusted dry flies to use in the river are midge and nymph imitations or the always faithful Parachute Adams in the summer; mayfly, black ant, stone and Copper John which is a wasp imitation in the spring, nymph and beetle or hopper in the fall. In the winter or cooler weather, a coachman or wooly bugger wet fly seem to work the best. All the colors have to do with the cloud cover, the clearness of the water and barometric pressure. A light rod on the Truckee is important not only because you want less length because of the willows and cottonwood trees nearby (nothing worse than spending hallowed fishing time unhooking from trees) but because feel is everything with Brown and Rainbow trout. Some other species of trout are also present in some spots in the Truckee including a few Brook Trout and Cutthroat Trout. Since 99% of the river’s trout are planted, you will find very few native fish although the mountain white fish is considered native now since first introduced forty years ago. White fish will take to wet flies and occasionally dry flies as well and they are fun to catch and release. All through the years, I have released many more fish than I have kept at Pyramid and on the Truckee. It’s the strategy, the hook up and the struggle that is the draw for me although all these fish are extremely good eating, fried, pouched, baked or barbecued. The Truckee is also great for lure fishing with quarter to eighth ounce or smaller little cleos, rooster tails, daredevils, and panther martins. Again, color is of the essence to catching fish. Dark for dark waters and cloudy days and light for clear waters and clear days is the general rule, but bring enough of both to equip yourself for many variables. Several spots are exceptional for larger fish for fly fishermen on the Truckee including west of Verdi (notably west of Crystal Peak Park) and between the Mayberry Bridge west to Mogul. For lure fishing on the river, you can go just about anywhere the water is running, but the best spots seem to be where there is a spring or creek running into the river. Minnows are attracted to these areas which is the imitation you are using when you use a lure. The Nevada Department of Wildlife heavily regulates fishing in Nevada tributaries and lakes http://www.ndow.org/law/regs/fishregs/, so please understand and follow the regulations. You can buy a fishing permit almost anywhere fishing supplies can be purchased. At Pyramid Lake, the Cutthroat Trout like to hit the large wooly bugger but I have had good luck with many other wet flies including the Bunny Black Leech and Marabou Black. Pyramid takes a much different fly rod that will handle the weight forward lines used to project the fifty to one hundred feet of line in front of you. If you don’t have a fly rod, you can use a spinning rod of six to eight feet in length that will need to project a weight and wet fly forward to fifty yards. Both methods use a slow retrieval process that attracts trout by imitating what the dragonfly nymph or small chub minnow does on the sandy floor of the lake. For the fly fisherman, the best places to fish are the sandy shallow areas and bays. Some fly fishermen have constructed chairs that can be positioned near drop offs so they can fish their flies without having to worry about waves cresting over their chest waders. The great thing about using a spinning rod for wet flies is that you can convert quickly to lures if flies do not seem to be attracting the lunkers. The lures that work best seem to be the daredevil, the panther martin, Little Cleo and any number of large half ounce or larger spoons sold by many companies that wobbles when fished. The wobble attracts because it looks like a minnow moving rapidly to get away from a larger fish. Oh yes, by the way, the waders are necessary for both the Truckee and Pyramid but you could get by with hip waders or just good old tennis shoes in the summer in the river. Pyramid on the other hand takes waders to get out to the near the drop off where the fish move along unless you find a point to fish off of which is right over the drop off. Spots at Pyramid where the drop off is near a point include Spider Point, Pelican Point, and Warrior Point north of Sutcliffe and the Block House, Popcorn and Cattle Guard Point at the south end. If you have chest waders, the entire west side of the lake is attractive as well as Dago Bay north of where the Truckee River comes into the very south end of the lake. No fishing is allowed at the Needles at the north end from the shore but boat fishermen normally like to fish from 9-Mile north through Fox Bay and Hells Kitchen in the late spring. Boaters also can be found in larger groups along the Nets, Pelican Point on the west side and Anderson Bay on the east side most of the fishing season. Regulations are strict at both waters. Pyramid Lake is only open in the fall, winter and spring and closes in the summer so the fish will become even larger without pressure from fishermen. There are extremely large trout at the lake and every year there are many ten pound and above trophy’s taken by both men and women. On the Truckee, the trout average in the half pound range but occasionally a five pounder is caught. When I was growing up, it was common to catch two pounders and sometimes six to seven pounders. A five pound brown taking out your half pound strength line on a barbless dry fly about the size of a large wood ant is something every fisherman should experience. The same goes for Pyramid Lake. My wife caught her first eleven-pounder several years back and was hooked. Although we have caught many lunkers at Pyramid, some of the twelve to fifteen pounders I regularly caught when I was growing up are few and far between now. The average Pyramid Lake fisherman will catch at least one five to seven pounder over 24 inches per season. Everything under 24 inches should be thrown back but there is a slot keeper between 17 and 20 inches if you have a hankering for a tasty meal. The limit is two trout per day but no more than one of them can be 24 inches or longer. So you can keep a couple of slot sized (17” to 20”) or keep one slot sized and one 24” or larger. 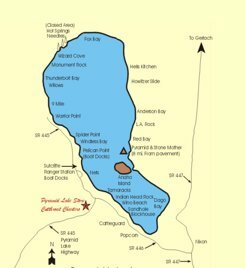 The Pyramid Lake Paiute Tribe has more on the fishing regulations at Sutcliffe or the store at the west entrance to the lake on Pyramid Highway before you get to the hill going into the lake. Or you can visit the website http://www.crosbylodge.com/. 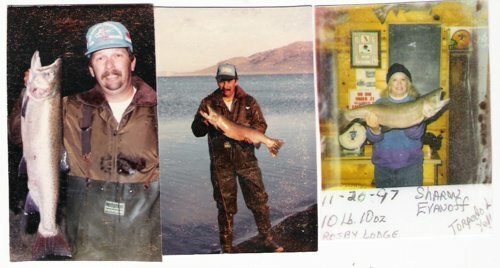 If you drop by Crosby Lodge, you can visit an entire wall of 10 pounder or bettor Cutthroat Trout and you’ll see some pictures like below of us and your fishermen friends. In the next few months I’ll drop you in on specific stories about fishing the Truckee River and Pyramid Lake.